Investing in your own earnings potential is often a very good idea (e.g., by getting a particular certification, license, or degree in your line of work, or by putting money into a business that you’re starting), even if it means putting off saving for retirement for a brief period. This is especially true for people early in their career, because the increased earnings will be in effect for many years. If you want to actually make a comparison of rates of return, you first need to come up with a year-by-year estimate of the cost and the payoff from the investment you’re considering. In some cases you may be able to find good statistics on the topic (e.g., how much more, on average, do people in your field with a particular certification earn than people without that certification?). Then you can use the IRR function in Excel to calculate the rate of return from the projected cash flows. The tutorial in the previous link explains how to use it, but it’s pretty straightforward. You type the projected cash flows in a column of cells, with the cash outflows (i.e., the money you expect to spend) as negative values and the cash inflows as positive values. Then, in another cell, you use the “IRR” function, selecting the range of cells that includes your projected cash flows (e.g., “=IRR(A1:A17)”). It varies quite a bit from one case to another, but it’s not at all rare for the rate of return from career-related expenditures to greatly exceed the rate of return you could expect from regular stock/bond investing. It is important, however, to recognize that comparing a projected rate of return from career-related spending to the rate of return you would expect from additional retirement savings isn’t an apples-to-apples comparison, as the risk level may be quite different. 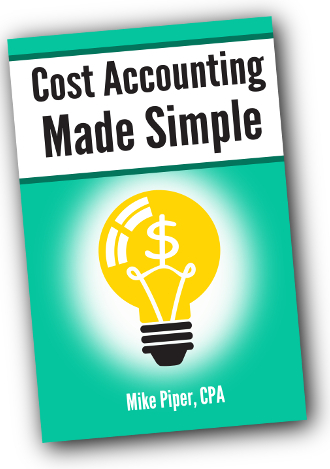 For instance, if you’re a 23-year-old accountant, getting your CPA certification is very likely to substantially improve your earnings over the course of your career. Frankly, this is probably less risky than putting money into a stock index fund. The hoped-for increase in earnings is very likely to actually occur (i.e., it is not especially speculative). The total U.S. stock market (as measured by the Vanguard Total Stock Market Index Fund, VTSMX) fell by less than 10% last week. If that made you super nervous, that’s a good indication that your stock allocation is too high. A 10% decline should not be a big deal — especially when it comes after a 9-year bull market during which the value of U.S. stocks rose by roughly 400%. If a decline of less than 10% makes you nervous at all, imagine how you’ll feel about a 30%, 40%, or 50% decline. The goal of asset allocation is to craft a portfolio with which you’d be able “sit tight” (or possibly even rebalance into stocks) during a full-blown bear market. But how useful is that information for the purpose of predicting returns going forward? The following chart shows the correlation between the S&P 500’s valuation (as measured by PE10) and its inflation-adjusted returns for periods of various lengths from 1926-2017. As you would expect, the correlation is always negative, which means that the higher the market’s valuation at any time, the lower we should expect returns to be going forward. 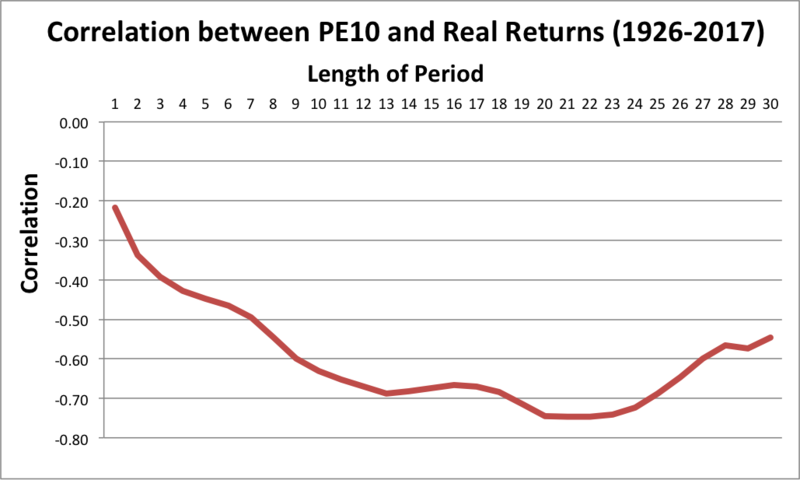 But the correlation between PE10 and ensuing short-term returns has been pretty weak. For instance, the correlation coefficient between PE10 and 1-year returns is just -0.22. The correlation is quite a bit stronger if we look at 10-year real returns (-0.63 correlation) or 20-year real returns (-0.75 correlation). In other words, valuation levels are not very good at predicting short-term market returns. They are much better at predicting longer-term returns. Point being, we never know what’s about to happen in the near term. So valuations aren’t very useful for trying to “dodge” a bear market, so to speak. And with today’s high valuations, we should expect pretty modest returns — suggesting that high savings rates (for those in their accumulation years) and low spending rates (for those in their retirement years) are probably prudent. This was true a year ago, and it’s still true today. Should you use international bonds? 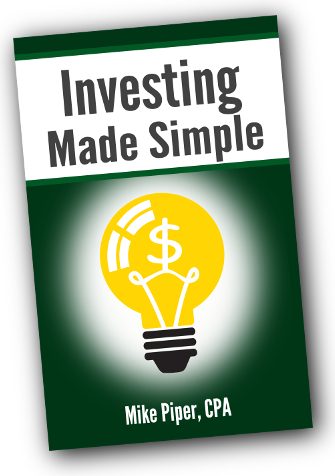 Should you use “smart beta” funds? Should you tilt toward small/value/momentum/profitability? Should you include corporate bonds in the portfolio? A TIPS fund? Should the bonds be short-term, intermediate-term, or long-term? How often should you rebalance to your target allocation? When getting started, most people should ignore all of the above topics and simply start with a “three fund portfolio,” or possibly even a low-cost “all-in-one fund” (e.g., a Vanguard Target Retirement fund). There are other financial planning topics that are much more important. It’s only after taking care of all of these items that it would make any sense to think about things like whether or not your portfolio should include “smart beta” mutual funds. And even for people who have taken care of these other financial planning to-do items, there’s still no need to spend time thinking about all of those advanced asset allocation questions. In nearly all cases, it’s perfectly fine to stick with that simple “three fund portfolio” — or even the single all-in-one fund in some cases. *I’ve attempted to order this list roughly from highest to lowest priority. The exact order of priority will vary from one person to another though. For example, if you’re unmarried and have no kids, estate planning would be a lower priority than it would be for somebody with children. And estate planning would be an especially high priority for a married couple who each have children from a prior marriage. When Are Variable Annuities Useful? This is the final article in a three-part series about variable annuities. The first article discussed how variable annuities work. And the second article discussed how variable annuities are taxed. As a reminder, the death benefit is the fundamental insurance aspect of a basic variable annuity. The most common death benefit says that if you die while holding the policy and the account value at that time is less than your net contributions, your beneficiary will receive an amount equal to your net contributions rather than the (lower) account value. The problem here is that this is such a strange sort of insurance. It doesn’t protect you against loss. Nor does it protect your loved ones in the event of your death as life insurance would. Instead, it only protects if both of those events occur at the same time (i.e., you die and at the time of your death the account value is less than your net contributions to the policy). And even then the insurance only provides enough money to “top them off” (i.e., bring the amount they receive back up to the net contribution), whereas a simple term life policy could provide a much larger death benefit per dollar of premium. Another key point is that the death benefit is most likely to pay off in the first few years you own the policy, because at least in theory after several years the account value will have gone up. So you can eventually (sometimes quickly) reach a point where it becomes clear that the death benefit will have no value at all, and yet you’re stuck paying for the death benefit (via the “mortality and expense risk fee”) every year for the rest of the time you hold the policy. It’s not that the death benefit doesn’t have any value. The problem is that there’s nobody who needs exactly this sort of insurance. It’s not an especially good fit for anybody. A general financial planning guideline is that it doesn’t make sense to buy insurance that you do not need. And the death benefit on a variable annuity is insurance that most people do not need. The second insurance aspect of a variable annuity is the option to annuitize the policy (i.e., convert it from a somewhat-liquid asset into a guaranteed stream of income). But that’s not necessarily valuable in itself, because with any other liquid asset you always have the option to sell it and simply buy an immediate annuity with the proceeds. In other words, the ability to annuitize a deferred variable annuity only ends up being helpful if it helps you avoid a meaningful tax cost on that exchange or if the variable annuity has a meaningfully higher payout than what would be offered on the market for immediate annuities. A variable annuity could be a useful part of a financial plan when a particular rider provides a high value to you relative to its cost. The trouble here is that the value of a rider is usually super difficult to determine. The insurance company has a team of actuaries, financial analysts, and attorneys working together to create the product in such a way that they believe it will be profitable for them. The consumer, on the other hand, doesn’t have nearly the same level of information or analytical ability. And when a financial services company has a significant information advantage over the client (that is, when the client can’t really tell whether they’re getting a very good deal, a very bad deal, or somewhere in the middle), it is not usually the financial services company that gets the short end of the stick. This doesn’t mean that you should never purchase a variable annuity, nor does it mean that you should never purchase a rider on a variable annuity. It does, however, mean that you should be very skeptical about whether or not you’re getting good value for your money. This is uncommon, but it’s not unheard of. Also, this situation would be significantly more common if interest rates were higher because the annual tax cost of holding regular “total market” bond funds in a taxable account would be greater than it is at the moment. The most common financial planning use of variable annuities is simply as a replacement for worse (i.e., more expensive) variable annuities that a person has already purchased. As we discussed last week, if you liquidate a variable annuity, there can be undesirable tax consequences. If, however, you exchange that variable annuity (via a “1035 exchange“) for another variable annuity (or a qualified long-term care contract) then you do not have to pay any tax on the transaction. As a result, for people who have purchased very expensive variable annuities, it is often advantageous to exchange them for variable annuities with lower ongoing costs (e.g., the Vanguard Variable Annuity or the Monument Advisor variable annuity from Jefferson National/Nationwide). A key point, however, is that a 1035 exchange only gets around adverse tax consequences. It does not get you out of paying surrender charges.